HMRC is responsible for collecting repayments of Income Contingent Student Loans in cases where the borrower is within the UK tax system and no longer in higher education. Since 6 April 2016, two types of Student Loans are to repaid via deduction through payroll - Plan 1 and Plan 2 loans. Plan 2 applies if you studied in England and Wales and started your studies on or after 1 September 2012. Otherwise Plan 1 repayments apply wherever you studied in the UK. HMRC will notify an employer of when student loan deductions are to start for an employee via form SL1. HMRC will notify an employer of when student loan deductions are to stop for an employee via form SL2. Once an employee's income goes over the relevant threshold, the employer will deduct 9% of their income that's over the threshold towards repaying their loan. 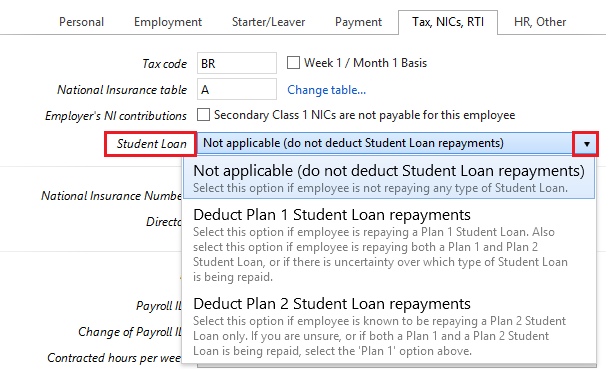 The payroll software will now automatically calculate and apply the appropriate student loan deduction as per the current Student Loan Deduction Tables.